So Friday saw us all up at the crack of dawn, yep ok, 7.00am after a night of sangria felt like the crack of dawn on the slowly undulating yacht I was lucky enough to be staying on. 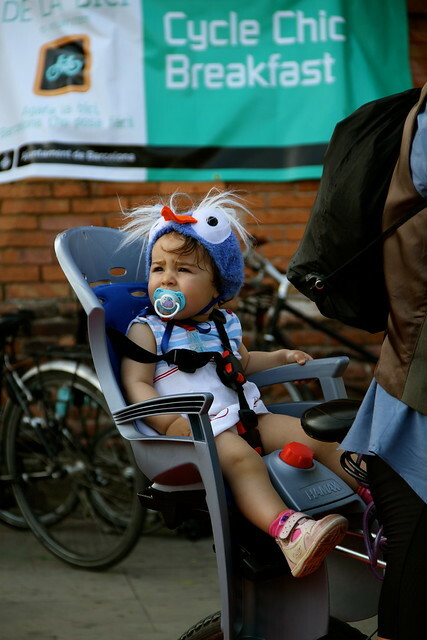 Our first official business as guest bloggers in Barcelona was to photograph the city's cyclists at a Cycle Chic Breakfast organised by BACC, the Bicicleta Club de Catalunya. Held to celebrate Bike Week in Barcelona, free breakfasts were given to riders along with some well-deserved red carpet treatment. 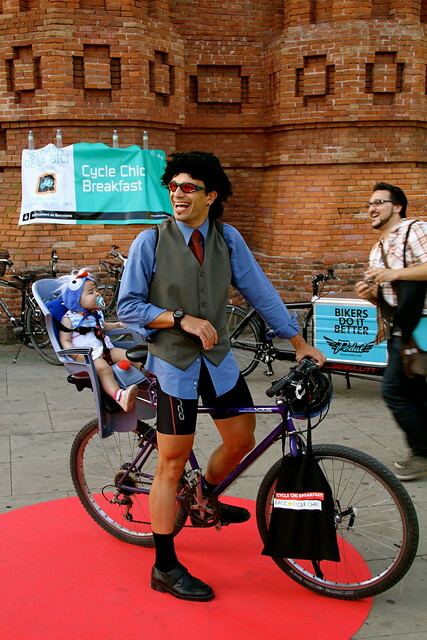 People in Barcelona really know how to dress and judging the chicest rider was a tough but pleasurable exercise. We took thousands of photographs between us over 3 venues through the city and then there was Paulette. Just brilliant. Hand painted bike and all. She is now the proud owner of a new Hood Bicycle and a rain coat from Italian brand Abici. Raul and Greta were obvious choices for the most fun category and won a selection of bicycle accessories from cool Barcelona brand Ramonas and a rain coat from Bordeaux brand Nooc. Such a fun day, there were prizes for the runners up too. I was interviewed by Spanish newspaper El Pais who featured the event in this article and this blogpost and TV1 Espana shot a film of the breakfast for morning tv. A more Almodovarian experience I have not had! I saw the guy in sort and the black mop and was sure he must have won. Raoul I think. How did you get to stay on a yacht?